Developed though extensive efforts by Dr. Gordon Prine (University of Florida) in conjunction with Dr. Jerry Baker (the Noble Foundation), BRUISER was selected through a six cycle breeding program for disease resistance and cold tolerance. BRUISER is a late maturing, widely adapted diploid annual ryegrass with the added benefits of disease resistance to crown rust resistant, some gray leaf spot resistance as well as helminthosporium leaf spot resistance, and it is tolerant to cold temperatures. Bruiser showing its winterhardiness on the left in photo on left and on the right in photo on right. University of Kentucky, 2009. Click on any photo to enlarge. Beef, dairy, and other livestock forages systems to be utilized as pasture, intensive grazing, green chop, haylage, or dry hay. Quick cover and quick forage yield. Use a Brillion seeder, a no-till drill or broadcast followed by a culti-packer. BRUISER can also be frost seeded. Seed to soil contact is vital to having a successful stand. Plant �" deep. BRUISER is highly palatable; avoid over grazing. Graze at approximately 10-12 inches and remove animals when at 3-4 inches. 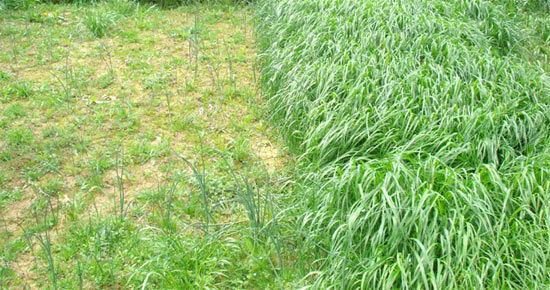 When grazing BRUISER, consider reduce grain levels and consider adding more fiber to the ration. If machine harvesting disc mowers and drum mowers are highly preferred. For high quality hay, harvest 1st cutting at boot stage. *As with any forage, management practices dictate the yield and quality of the forage nearly as much as the genetics of the product. 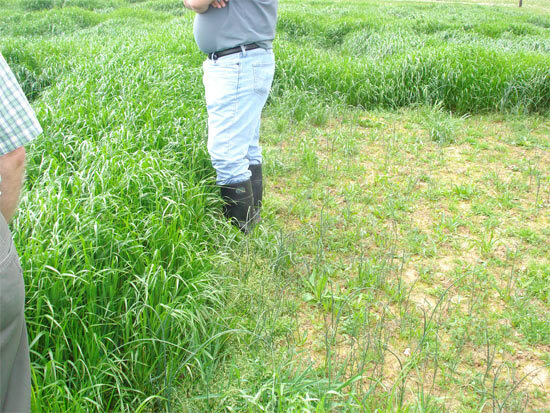 With proper management practices, BRUISER should provide high yielding, high quality forage that should result in improved producer profitability.